Restoring Property, Restoring Lives in the Quad City area, 24 hours a day, 7 days a week, 365 days a year. We are a full-service disaster restoration company committed to handle every claim backed by our president Michael Simons, who has served the area for over 40 years! Our service is coupled with compassion and sensitivity while helping those suffering a loss. Our comprehensive operation can handle everything from basic emergency board-up services to demolition and reconstruction of million dollar commercial properties. Maintaining a focus on minimizing not just the financial and physical, but also the emotional impact associated with a property loss, is an integral part of the business philosophy that makes Blaze Restoration unique. Blaze is a proud recipient of the BBB Torch Award for Integrity and Business Ethics with a longstanding A+ rating. 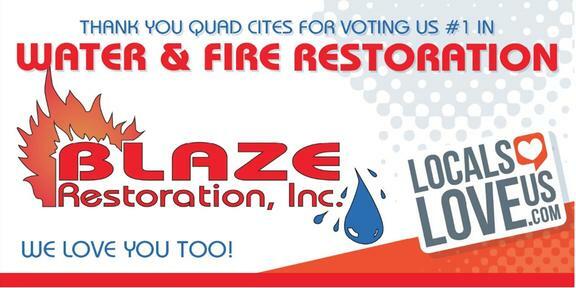 Reviews for Blaze Restoration Inc.